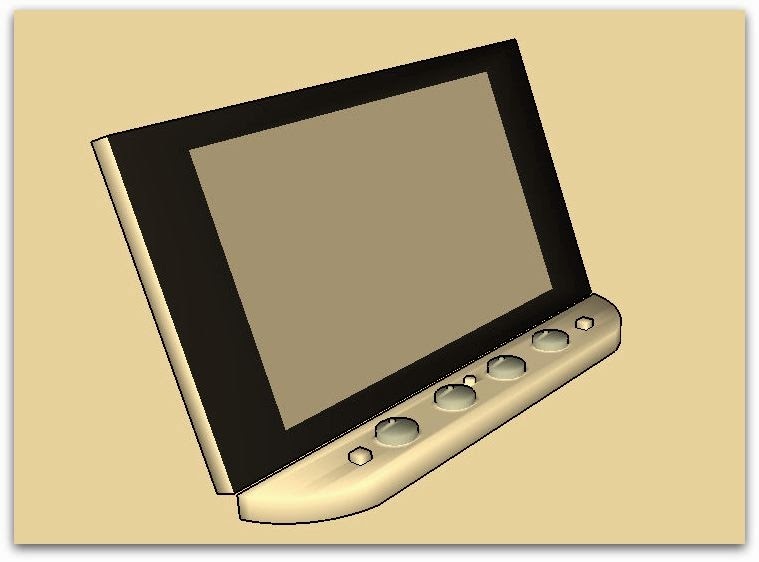 This concept design allows physical controls to be added to any Android 7" tablet pc. This allows easy grip silicone rotary knobs to be used for frequently used features such as volume, scrolling, video position, camera settings, radio tuning controls etc. Many of us prefer real physical controls, e.g. photographers, musicians, assisted living applications. A current 7" tablet pc is like handing a slippery sheet of glass. Each rotary control is a digital potentiometer with 1024 bits of resolution, tactile feedback and is also a push switch. Physical push switches are also provided, these can be used for power on/off. High power speakers are also included. The device can be used in portrait or landscape mode, the tablet's accelerometer automatically sets this and also the stereo speaker orientation (tablet's speakers or device). Additional sensors such as local and remote temperature sensors can be added. The device is clipped onto the tablet computer, automatically detected and communicates via Bluetooth Low Energy. A USB charger socket is provided for the internal battery. Size 200mm x 30mm x 8mm. Powered by ARM microcontroller with Bluetooth. The controls illuminate in the dark. A silicone grip allows easier hand control for the tablet computer. A tilting hinge is also included. In portrait mode the device can be held in either left or right hand. Sensors in the hand grip allow for medical sensors in future designs. Tactical feedback can also be provided. flash for camera as omitted on some tablets. There is a device that provides camera buttons for the iPhone but it has dedicated controls for a camera function only, e.g. the Red Pop. There is also an accessory for the iPad to provide easy grip but no controls. The new device can be created with a 3D printer including the integral control knobs. Their position is detected using a low cost robust non carbon potentiometer. This design can be built as a working 3D printed prototype.